The microbe was found at 2,352 metres depth in the Atlantic between Norway and Greenland. In a new study, published in Nature this week, a research team led from Uppsala University in Sweden presents the discovery of a new microbe that represents a missing link in the evolution of complex life. The study provides a new understanding of how, billions of years ago, the complex cell types that comprise plants, fungi, but also animals and humans, evolved from simple microbes. Cells are the basic building blocks of all life on our planet. Yet, whereas the cells of bacteria and other microbes are small and simple, all visible life, including us humans, is generally made up of large and complex cell types. The origin of these complex cell types has long been a mystery to the scientific community, but now researchers from Uppsala University in Sweden have discovered a new group of microorganisms that represents a missing link in the evolutionary transition from simple to complex cells. In the 1970s, the acclaimed biologist Carl Woese discovered a completely new group of microorganisms, the Archaea, and showed that these represented a separate branch in the Tree of Life - a finding that stunned the scientific community at the time. Despite that archaeal cells were simple and small like bacteria, researchers found that Archaea were more closely related to organisms with complex cell types, a group collectively known as ‘eukaryotes’. This observation has puzzled scientists for decades: How could the complex cell types from eukaryotes have emerged from the simple cells of Archaea? In this weeks’ edition of Nature, researchers from Uppsala University in Sweden, along with collaborators from the universities in Bergen (Norway) and Vienna (Austria) report the discovery of a new group of Archaea, the Lokiarchaeota (or ‘Loki’ for short), and identify it to be a missing link in the origin of eukaryotes. “The puzzle of the origin of the eukaryotic cell is extremely complicated, as many pieces are still missing. We hoped that Loki would reveal a few more pieces of the puzzle, but when we obtained the first results, we couldn’t believe our eyes. The data simply looked spectacular”, says Thijs Ettema at the Department of Cell and Molecular Biology, Uppsala University, who lead the scientific team that carried out the study. “By studying its genome, we found that Loki represents an intermediate form in-between the simple cells of microbes, and the complex cell types of eukaryotes”, says Thijs Ettema. When Loki was placed in the Tree of Life, this idea was confirmed. “Loki formed a well-supported group with the eukaryotes in our analyses”, says Lionel Guy, one of the senior scientists involved in the study from Uppsala University. “In addition, we found that Loki shares many genes uniquely with eukaryotes, suggesting that cellular complexity emerged in an early stage in the evolution of eukaryotes”, says Anja Spang, researcher at Department of Cell and Molecular Biology , Uppsala University, and one of the lead-authors of the study. The name Lokiarchaeota is derived from the hostile environment close to where it was found, Loki’s Castle, a hydrothermal vent system located on the Mid-Atlantic Ridge between Greenland and Norway at a depth of 2,352 meters. 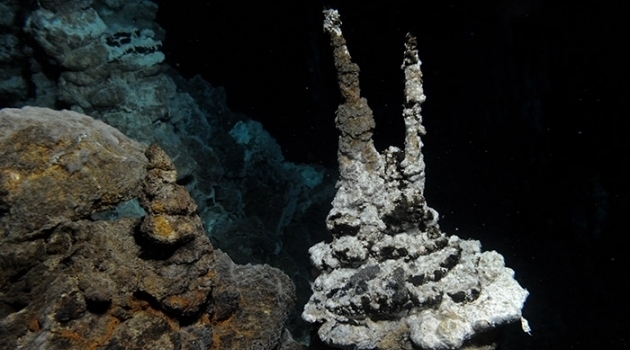 “Hydrothermal vents are volcanic systems located at the ocean floor. The site where Loki is heavily influenced by volcanic activity, but actually quite low in temperature”, says Steffen Jørgensen from the University of Bergen in Norway, who was involved in taking the samples where Loki was found. “Extreme environments generally contain a lot of unknown microorganisms, which we refer to as microbial dark matter”, says Jimmy Saw, researcher at Department of Cell and Molecular Biology, Uppsala University, and co-lead author of the paper. By exploring microbial dark matter with new genomics techniques, Thijs Ettema and his team hope to find more clues about how complex cells evolved. “In a way, we are just getting started. There is still a lot out there to discover, and I am convinced that we will be forced to revise our biology textbooks more often in the near future”, says Thijs Ettema.